Do we sabotage our own happiness? Some people certainly do, perhaps out of fear of the unknown or possibly because of a deeply held belief that they are undeserving of happiness. Cellular biologist and ex-soldier, Lena (Natalie Portman, JACKIE), and her US Army Special Forces soldier husband, Kane (Oscar Isaac, STAR WARS: THE LAST JEDI; SUBURBICON; STAR WARS: THE FORCE AWAKENS; A MOST VIOLENT YEAR; EX MACHINA; INSIDE LLEWYN DAVIS), are a couple who sabotage their own happiness in screenwriter-director Alex Garland’s (EX MACHINA) latest film, ANNIHILATION. Seemingly happy together, Kane enlists in a secret mission and is presumed dead only to pop up one year later with no recollection of where he’s been or what he’s been doing all that time. When he suddenly takes ill, the army quickly scoops both him and Lena up, and brings them to a secure facility known as Area X, located somewhere in the Florida panhandle. There, Lena meets psychologist, Dr. Ventress (Jennifer Jason Leigh, THE HATEFUL EIGHT; THE SPECTACULAR NOW), who tells her that a mysterious object from outer space had crashed into a nearby lighthouse and unleashed an electromagnetic phenomenon that is altering life as we know it in the immediate area. This phenomenon, referred to as the “Shimmer”, is growing in size and, because of that, Kane had volunteered to enter the affected zone on what was essentially a suicide mission to stop it. As Lena learns, a number of soldiers had gone in before him but, until Kane, no one had come out. While Lena is at the facility, she learns of a new mission that is about to go in and she volunteers to join it. Accompanying her are a physicist, Josie (Tessa Thompson, THOR: RAGNAROK; CREED; TV’s WESTWORLD), an anthropologist, Cassie (Tuva Novotny), a paramedic, Anya (Gina Rodriguez, DEEPWATER HORIZON) and Dr. Ventress herself. Once inside, Lena and the other women face ferociously lethal challenges while the Shimmer alters not just their minds and bodies but time and place as well. ANNIHILATION is based on the first book of the sci-fi Southern Reach Trilogy by Jeff VanderMeer. Like EX MACHINA, Garland gives audiences plenty to take in, both visually and philosophically, but unlike that previous film, some of it works here and some of it doesn’t. Critics have been almost unanimous in their praise of this film; audience reaction, however, has been only mildly positive. Apparently, following a less than enthusiastic test screening, Paramount exec David Ellison asked for changes to make the film appeal to a wider audience, feeling that the story was “too intellectual” and “too complicated”. Garland and Oscar-winning producer Scott Rudin, however, stuck to their position and the film remained as is. The compromise, though, was that ANNIHILATION would only get a cinema release in the US and China. Everyone else has to see it on Netflix. I can certainly understand Ellison’s position, though I applaud the director’s and producer’s courage to back their work. The story asks more questions than it answers, and many choices that the characters make, or are forced to make, are simply implausible. That can make for some very frustrating viewing. The visuals, however, are spectacular, from the technicolor flowers and hybrid creatures found inside the Shimmer to Lena’s encounter with their source at the lighthouse. It’s like being on an acid trip where both incredible beauty and extreme danger abound. Neither as powerful nor as disturbing a film as EX MACHINA, ANNIHILATION is still well worth watching because it will make you think. It’s a shame, though, that most of us won’t get to see it on a large screen, which it deserves. 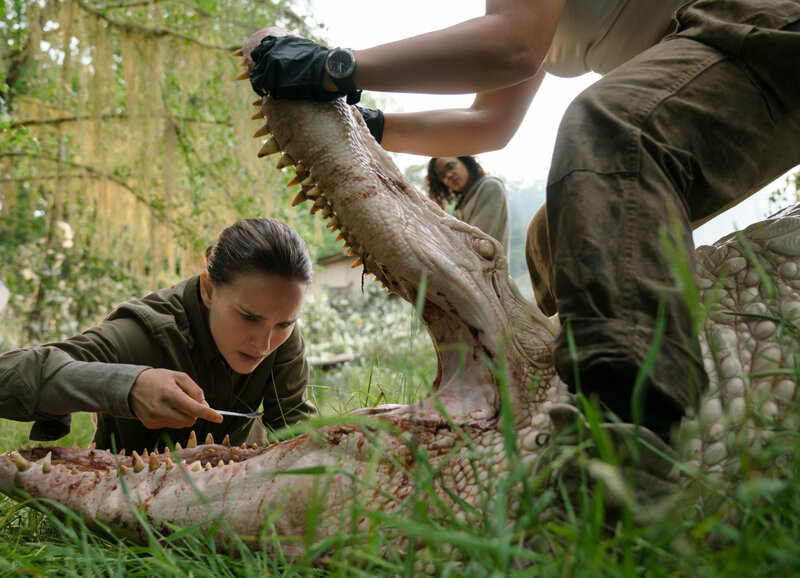 ANNIHILATION is available on Netflix. Watch the review recorded on Facebook Live on Thursday, November 15th at 8:30 am HK time!